The argument is often made that a government-run medical system is necessary in this country, because Americans spend a great deal on health care relative to citizens of other advanced industrial countries without getting comparable results. Might I respectfully suggest that anyone who believes that a government-run system will deliver more bang for the buck consider the case of the public schools? Not that I disagree with the main point. UMm . . . Kate, did you see the flat line?!?!?!? I am not talking about the education charts. I am asking for a definition of terms in the healthcare part of the post. I do not disagree with the main point and have made it myself, even on this blog in argument. No one is happy with the public school system. That has to be an exaggeration. But I have not spoken to anyone nor read anything that expressed pleasure or even satisfaction with the status quo in education the US. "Pay the teachers more and the quality will rise!" really hasn't happened. Nor have special programs for special children. Nor has any of the NCLB or any other such program had any significant positive effect. I agree that giving our healthcare system to the federal government will likely have the same effect. I just want to know what comparable results we are not getting relative to other advanced industrial countries in current medicine. Kate, I should've been clearer--what I meant to say was that (according to critics, anyway), we might have a pretty good health care system, but not one that is commensurate with the amount of money that Americans spend on health care. The problem is, our health care system is an awful hybrid of private and public. We do spend a grievous amount on medicine but our outcomes don't really reflect it (although some of this has to do with our population composition, which is heavy with poor minorities and immigrants, unlike Europe). While the Left takes these facts to justify a single payer (i.e., government-run) system, I think what needs to happen is to throw government out of the medical business altogether, or perhaps simply provide nationwide catastrophic insurance. Medical costs began to go crazy once Medicare was instituted back in the 1960s. Third payer systems are inherently corrupt and costly. Unfortunately, I don't see real reform happening in this country. Costs are so great that people scare easily. It would take some kind of financial apocalypse for us to really handle the problem as it should be handled. Name one government agency, be it either local, city, county, state, of federal agency that anyone gives the taxpayer bang for the buck. John Moser, thank you. I was first hospitalized in 1969, in a ward in the one hospital in Salem, Oregon. There was a room divider that gave us the relative privacy of four beds; that was an innovation. Privacy depended on the scruples of your doctor. You should BYOPJs, except for surgery day and you brought your own toothbrush or did without. You could have a telephone for an extra charge and there was certainly no TV. I do not recall all the plastic stuff nor all of the equipment in a room like today. The modern way is more expensive. So are all of the tests that can, or must, be run. So is the educations, not only of doctors and nurses but of all the various technicians to run the machines used for the tests. The administration of hospitals is all about written justifications and accountability to private and public entities and is also an expense. There are hospitals everywhere, with branch facilities and Urgent Care centers -- the local supermarket has offices in it for routine medical care. Heck, it is all expensive but no one wants to go back to the way things were when medicine was cheaper. If we decide that fair and equal is the most important quality in medical care, then we are going to have to go back to the old way of doing things, or something like it. No one really wants to economize; the trend is all the other way. Redwald has it right. Medicare and medicaid distort the system by making third party payment the norm, rather than an actual pricing system involving supply and demand. Providers bid like unions for the highest possible payment, while insurers keep it as low as possible and the patient takes no account of the cost. This is irrational. Medical insurance is the only type of insurance that tries to cover everything, as opposed to major costs for which it is difficult to budget. Imagine if we had food insurance how people would select their cuisine. Auutomobile expenses would rival medical expenses if it auto insurance covered routine maintenance. You can buy automobile insurance that covers routine maintenance. Most of the time the dealership tries to sell it when they sell you a new car... (I agree that it is almost never worth it). You also have insurance policies that cover repairs. Potentially food insurance which only covered "healthy" choices would be interesting. In terms of higher education, one could consider the meal plans at colleges to be a form of food insurance. Of course private schools like Ashland don't maximize health @ Convo...they have healthy options, but also all you can eat soda and cake. Actually if you look at public school cafeteria choices they have a modicum of health centeredness...at an affordable price. Not even close to being as good/tasty as Convo, but much cheaper/healthier. In terms of insurance policies that cover repairs...I would consider these a mixed blessing for those who have difficulty pricing in the value of a used car. A new car @ 2k down and 300 a month vs. a used car for 2k with a $100 a month repair insurance (covers transmition, engine, et al, with no deductible). I think the critics are right. Just compare Canada to the U.S.
Of course anyone has to admit that the U.S. is subsidizing Canadian health care costs... They have capped the amounts of profits drug companies can make, so companies end up charging more to customers where it is legal to do so. Also when I think about your combo I reach a different conclusion. But this is because what is being measured is essentially a statistically significant "end of history" so to speak. That is there are many factors conspiring to kill us...so there is a sort of natural limit to longevity that is in econ speak inelastic. If a good is inelastic, then it is almost always going to look bad on one of these political hack graphs when compared to price increases. Even in these times of "demographic" crisis... the average age of the U.S. has not fluctuated all that much. 2.5 years is a whole lot since 1990... but if you chart that with say the price increase of Apple stock (only slightly less ludicrous and more honest, because it does not hint at relevance) you essentially get a flat line. So yes test scores are inelastic...because IQ is more or less inelastic (and this is the highest correllator). Actually given the rise of employment in education... one could wonder at how big of a hit the middle class would take if these jobs were eradicated. 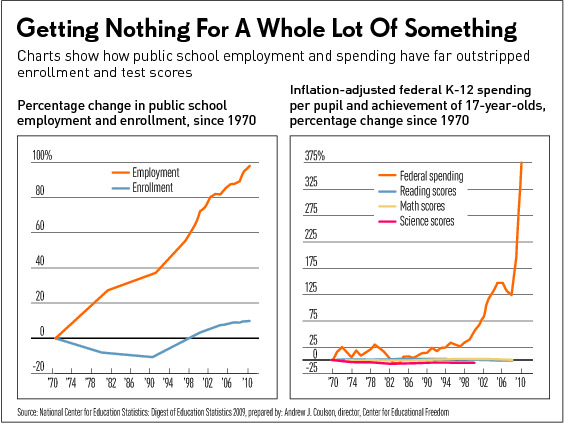 The graph is less dramatic if you don't use federal spending, but an overall education spending graph. So it is quite possible that the U.S. spends too much on education, and too much on healthcare, when an apple for the teacher and an apple a day can keep the doctor away. I might even argue that it is part of the service that you provide... (some history majors might end up as doctors...or perhaps as lawyers impacting the healthcare field). So if the question is: Why study history? (very few folks argue that you shouldn't because it is irrelevant to the practice of medicine). So a Phd requires a B.S. which includes a modicum of history, and also english. I would argue that the projected deficit, or the projected spending on medicare and medicaid is creating a huge amount of promissory estopel, backstopping the educational investment, and also providing a rationalization for the estimates which prevent the community college from being outright fraudulent. The solution is simple, and if you don't like it you will have to blame Nixon. We are going to spend that money, old folks are going to get health care, teachers are going to teach, students are going to learn (or not). Also lets consider what Money actually is... essentially a point system created by legal gurus or administrators to keep track of virtue/productivity/whatever society values. When the government puts more money into the economy it essentially makes each point less valuable on a relative basis, but when it raises taxes or reduces spending it hurts those who went into debt, paying for an essentially flat line education, while also threatening the raison d'etre for that education. The government does not actually spend the money you send it. In fact all the money the IRS receives is destroyed or removed from the system. Deficit spending is just the difference between the amount spent and the amount destroyed. Health insurance that provides "routine maintenance" is useful if you have children or you are old. (Only the latter relates to the used car, although it should cost more, given that we are not given to chucking the old body in favor of a new one.) The young and healthy probably will not find it useful. Their need in health insurance is for the catastrophic, and if they are not stupid about themselves, catastrophes should be very rare. Unless she is pregnant, which they might consider catastrophic or not, depending on circumstances. There can be no doubt that Medicare/Medicaid has distorted the system. It is a government subsidy for every kind of health service; we have equal rights to MRI's. I either applaud that or deplore it depending on which principle I am standing on. I like the ideal of equality. But I find it appalling that the druggie who lives on the street and abuses his body in every way and has a Medicaid card has an equal right to treatment and a bed in the emergency room for his heart attack as the taxpaying homeowner with three kids who manages the local drugstore, eats his veggies and has insurance. If the druggie gets to ER first, the other guy will have to wait his turn, even though he is helping to pay for the druggie's treatment through taxation. But money as point system: we all (democratically?) participate in that system by making decisions about money unless government steps in and sets prices or devalues currency or selectively raises taxes or tariffs, subsidizes this or that (like education) or ..., and thereby makes our choices for us. Deficit spending, even when gargantuan, appears to be sustainable unless someone sneezes. It's a bet that nothing, or nothing much, nothing not readily fixable, will go wrong in the nation. Isn't the question facing us as a nation, in terms of spending by government, whether we have won or lost that bet? Have things gone wrong? Our economy is having a tickle in the nose, but it might not lead to a full-blown sneeze. Our international example of a nation that lost the bet, Greece, what do we think of what it is doing? It is interesting, as Kate and John point out, that automobile insurance for repairs does indeed exist, but only as warranties on new cars and of no value for used cars and not much for new cars, evidently. But no coverage for oil changes or parts replacement, right? At least the govenment is not trying to provide such "equity" for automobile owners.